ALS Research Forum | New Paths to Protect Synapses From Aβ? New Paths to Protect Synapses From Aβ? Many scientists now believe that Alzheimer’s disease attacks first at synapses. Mounting evidence shows that Aβ oligomers can wreak havoc on these vulnerable neuronal connections. But early synaptic damage remains a puzzle with many missing pieces. In particular, no one knows exactly how the process begins. To fill in this picture, researchers led by Francesco Cecconi at the University of Rome and the Santa Lucia Foundation in Italy examined synaptic changes in the brains of young AD mice. Their results, reported in the December 12 Nature Neuroscience, implicate an apoptotic protein, caspase-3, in the earliest Aβ-mediated synaptic and learning deficits. Significantly, Cecconi and colleagues showed that they could reverse Aβ-induced damage by inhibiting caspase-3, suggesting a novel avenue for therapeutic exploration. Meanwhile, researchers led by Sergio Ferreira at the Federal University of Rio de Janeiro, Brazil, took a different approach to restoring synaptic function. In the November 29 Journal of Biological Chemistry, they show that activation of dopamine receptors can prevent some of the same sorts of initial synaptic changes seen by Cecconi’s group. These findings complement a November 28 Nature paper that describes a novel mechanism by which Aβ oligomers dampen signaling through NMDA-type glutamate receptors (see ARF related news story). Together, these papers imply that focusing on the molecular mechanisms of synapse damage may help open up new therapeutic paths for early intervention. Although caspase-3 is best known for its role in programmed cell death, evidence has been growing that it acts on synapses as well. Researchers led by Mark Mattson at the National Institute on Aging in Bethesda, Maryland, saw synaptic caspase-3 activation in cultured hippocampal neurons when they stressed them with glutamate, and showed that the protease can cleave AMPA-type glutamate receptors, potentially modulating neuronal excitability (see Mattson et al., 1998 and Lu et al., 2002). A recent study tied the protease more directly to synaptic function, finding that hippocampal neurons need caspase-3 activity to internalize AMPA receptors and achieve long-term depression (see ARF related news story on Li et al., 2010). Cecconi and colleagues wondered whether caspase-3 might play a role in Aβ-mediated synaptic failure. To investigate this, first author Marcello D’Amelio used Tg2576 mice, which carry the Swedish APP mutation. These mice develop amyloid plaques and AD-like symptoms at six to eight months of age, but D’Amelio and colleagues discovered that at three months of age, these mice already demonstrated some dendritic spine loss and shrinkage as well as learning deficits in fear conditioning tests. The young mice also displayed altered electrical synaptic properties and increased long-term depression (LTD), which weakens synapses. Looking for molecular changes to explain this, the authors found that an AMPA receptor subunit, GluR1, showed less phosphorylation at serine 845 (pS845-GluR1). Dephosphorylation at this site is known to lead to internalization of AMPA receptors, and, indeed, D’Amelio and colleagues saw reduced levels of AMPA receptors at the synapse. The authors connected these changes to Aβ by showing that injection of a γ-secretase inhibitor, which reduced Aβ levels, also increased synaptic levels of GluR1, improved spine morphology, and rescued memory problems. This finding agrees with results from other groups, as researchers have shown that Aβ induces internalization of AMPA-type glutamate receptors (see ARF related news story on Hsieh et al., 2006) and can cause reductions in surface expression of GluR1 (see Almeida et al., 2005). Enter caspase-3. Activated caspase-3 decorated synaptosomes of three-month-old Tg2576 mice more heavily than those of two-month-old AD or wild-type animals, as visualized by several methods including immunoelectron microscopy. Application of a caspase inhibitor to three-month-old mice restored shrunken spines to their normal size and improved memory in vivo, and restored pS845-GluR1 levels in slice cultures. 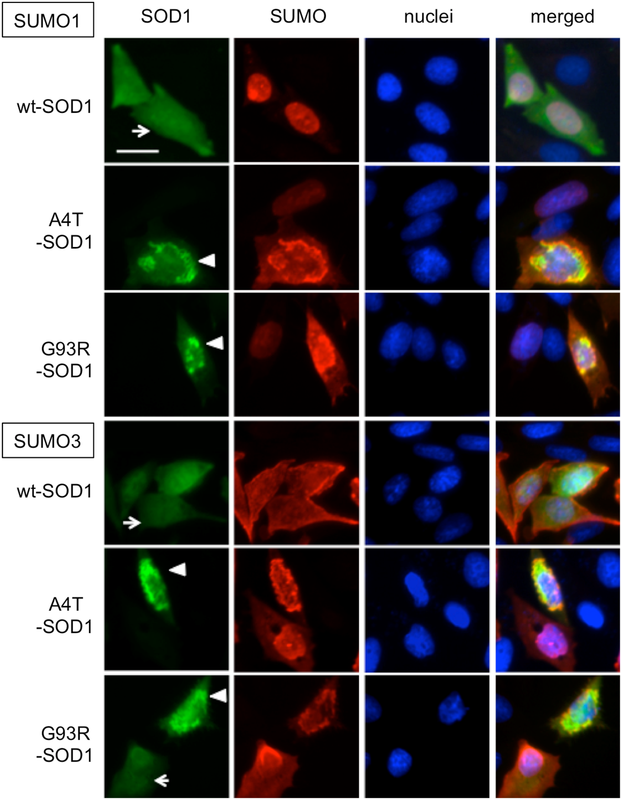 Since caspase-3 is known to activate the phosphatase calcineurin A, D’Amelio and colleagues also blocked calcineurin in slices, and saw a similar restoration of pS845-GluR1 levels. The data fit with work from Tara Spires-Jones and Brad Hyman at Massachusetts General Hospital in Charlestown, which showed that inhibition of calcineurin rescues spine loss in AD mice (see Rozkalne et al., 2010 and ARF related news story on Wu et al., 2010). Spires-Jones and Hyman have also seen caspase activation in AD mice, although in their work on older mice that overexpress tau, the activated protease led to tau cleavage and formation of neurofibrillary tangles. The data from Cecconi’s group would correspond to an earlier stage of AD, Spires-Jones said, perhaps analogous to a human who was pre-symptomatic. Spires-Jones speculated that in human disease, activated synaptic caspase-3 might ultimately cleave tau as well, leading both to synapse collapse and tangle formation. Echoing a common theme among commentators, Gunnar Gouras of Weill Cornell Medical College in New York City praised the thoroughness of the work. “This is an impressive study. It brings a new perspective to early synaptic damage.” Gouras said the data throw more pieces into the complex puzzle of early synaptic changes, in which diverse proteins have now been implicated, for example, the Fyn kinase fingered by Lennart Mucke’s group (see Chin et al., 2005) and the mammalian target of rapamycin pathway uncovered by Gouras and colleagues (see Ma et al., 2010). One of the next challenges, Gouras said, is to integrate all these studies and figure out what key players are mediating Aβ’s effect on synapses, and crucially, which one acts first. Cecconi agrees that it is essential to look at the earliest changes in AD to discover the root cause of the disease and open up more promising targets for early intervention. His group is now looking at events upstream of caspase-3 activation. For example, Aβ oligomers may cause oxidative stress on mitochondria, Cecconi said, and mitochondrial damage might lead to caspase activation. This idea fits with other work showing that Aβ can cause mitochondrial damage (e.g., see ARF related news story on Cho et al., 2009). Cecconi is also interested in the therapeutic possibilities of caspase-3. He is now studying the effects of long-term treatment of Tg2576 mice with caspase inhibitor to see if this can prevent the development of the disease. Other points in this pathway, such as calcineurin and calcium flux, might also make good therapeutic targets, Cecconi suggested. For people with AD, caspase inhibition might be problematic, however. In healthy mice, Cecconi and colleagues found that such inhibition caused problems with synaptic plasticity. “When thinking about a molecule that can interfere in this process, we should consider a modulator [of caspase-3] rather than a complete inhibitor. This would be a completely new class of molecules that does not yet exist,” he told ARF. In the nearer future, however, Cecconi believes that caspase-3 (or molecules related to its pathway) could make a good diagnostic tool, because its activation occurs so early in the disease. If it turns out that levels of caspase-3 or related molecules are elevated in the cerebrospinal fluid or blood of people with incipient AD, Cecconi said, then potentially a simple test could identify these people years before symptoms start. This would allow people to take preventative measures such as lifestyle changes, Cecconi suggested. Mattson agrees that caspase-3 inhibition is a chancy strategy in people, pointing out that when the protease is inactivated, neurons become more susceptible to excitotoxicity, and will undergo necrosis instead of apoptosis (see Glazner et al., 2000). Necrosis causes more brain inflammation and is more damaging to surrounding cells than apoptosis. Mattson suggested that more work should be done in human postmortem AD brains to determine whether activated caspase-3 plays a role at synapses in people. Some studies have already found caspase-3 enriched at human synapses (see Louneva et al., 2008). In the second paper, Ferreira and colleagues described a quite different system for investigating Aβ’s early impact. They treated hippocampal cultures from wild-type rats with soluble Aβ oligomers, yet they saw similar effects of Aβ on synapses. These included a drop in pS845-GluR1, increased internalization of AMPA and NMDA receptors, impaired long-term potentiation (LTP) and enhanced LTD, more activated calcineurin, and spine loss. Since activation of the D1/D5-type dopamine receptors has been shown to increase AMPA receptor insertion and improve memory, first author Sofia Jürgensen treated the cultures with a D1/D5 receptor agonist. The agonist maintained LTP in the face of Aβ treatment, kept the level of pS845-GluR1 high, and restored AMPA and NMDA insertion at the synapse. The results suggest that stimulating the dopamine system might be another potential intervention against memory loss. Ferreira said that he will next use animal models to discover if dopamine receptor activation has the same beneficial effects in vivo. A new Annals of Neurology paper by Jun-ichi Kira and colleagues at Kyushu University in Fukuoka, Japan, suggests it might: These scientists found that a different dopamine receptor agonist, apomorphine, improved memory and reduced levels of Aβ and hyperphosphorylated tau in the 3xTgAD mouse (see alsocomment by Ferreira). Moving the dopamine strategy to people is problematic, Ferreira said, even though dopamine agonists are already used in people for some psychiatric disorders and Parkinson’s disease. Mattson points out, for example, that dopaminergic drugs can have adverse affects in normal people, such as causing hallucinations or psychotic behaviors. Ferreira notes, however, that the dopamine system is also activated by behaviors such as exercise and cognitive stimulation, both of which are believed to help delay the onset of AD. The new data may provide a molecular explanation for this phenomenon, Ferreira speculated, and add to the evidence that lifestyle changes can be helpful in AD.